The Roman Catholic Church today completed the beatification of Alpandeire’s Leopoldo Sánchez Márquez de Alpandeire, of the Order of Friars Minor Capuchins with the reading of an apostolic letter issued by Pope Benedict XVI, and read to the devoted by Archbishop Angelo Amato of the Diocese of Sila. Estimates vary as to the number of people who attended the beatification ceremony, with Granada Hoy saying 60,000 devotees, whilst the church claims 120,000, however either figure if correct is a substantial number. Known locally as Fray Leopoldo but born Francisco Tomás Sánchez Márquez, Spain’s newest saint was born in Alpandeire, just a few kilometres from Ronda by Diego Marquez and his wife Gerónima Sanchez in 1864 and died in Granada on February 9, 1956. Alpandeire is also the birth place of Ronda’s favourite son Don Pedro Romero, the famous torero. As a young man Fray Leopoldo worked in Ronda out of necessity as the Cuban-American war claimed the life of his second brother and a drought prevented him staying home and working the family’s land. In 1899, at the age of 35, he travelled to Sevilla and joined the Capuchin Order as a novitiate and adopted the name Leopoldo. 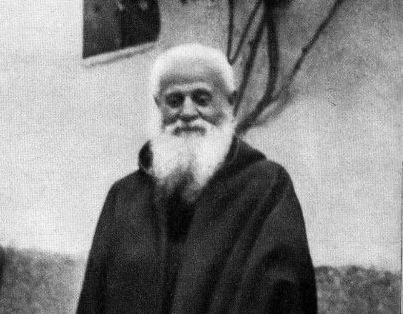 Shortly after taking his vows in 1904 Fray Leopoldo was sent to Granada with his begging bag to live a life of poverty caring for others and offering to pray for any who needed it. For 49 years the friar wandered the streets of Granada asking only ‘Three Hail Marys’ for his labours and prayers, and even as an old man he still kept at his vows. “During his lifetime the friar was not known for performing miracles”, Archbishop Amato was quoted as saying, “in fact he diligently performed the monotonous small chores each day as if it was the first time ever”. It is for this reason the church elevated Fray Leopoldo to the status of candidate, and then venerable after those who knew him confirmed his holy life. Fray Leopoldo’s confirmation to sainthood was recognised after a Puerto Rican woman, Lleana Martinez, was inexplicably cured of Lupus after her priest prayed for help from Fray Leopoldo whilst administering the last rites. Today’s ceremony was attended by all senior clergymen of the Roman Church in Andalucia, as well as politicians across the political spectrum.